Canadian Breakdown is a great fiddle tune. 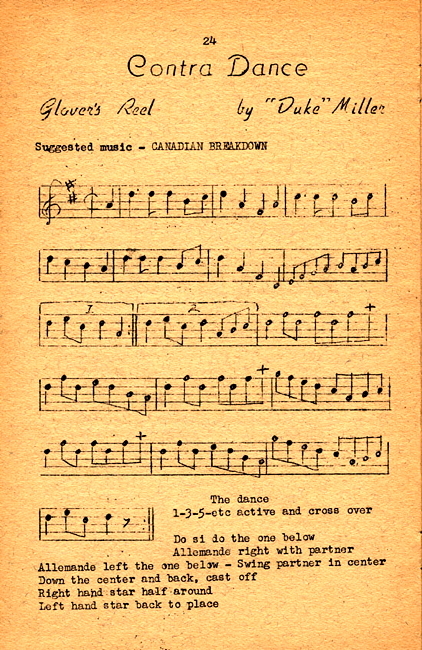 Eleanor Boyer taught a contra to that name at Texas Camp in 1961 that strongly resembles Glover's Reel, the second dance described, and for which Canadian Breakdown is a recommended tune. Formation: Longways set: a line of men, L shoulders to top of set, facing a parallel line of women. It's a duple minor improper: subsets of 2 couples with couple 1 in each others' places. 1. Balance partner and do-si-do. This call is for the active couples only. 1 Step to R onto R ft (ct 1), swing L ft in front of R ft (ct 2). 2 Repeat action of ct 1 with opposite footwork. 3 Walk forward, passing partner by the R shoulder. 2. Allemande left with the one below. 3. Balance, 4 in line. Join hands at shoulder height in a line of 4 across the set. 17-19 Active couples, hand in hand, woman to man's R, walk down the set 6 steps. 6. And come right back. 7. Cast off to a right hand star. Each man holds woman's R hand in his R hand at woman's R waist and holds woman's L hand forward in his L hand. 22-24 Actives continue walking forward to turn as a couple with the inactive, 3/4 'round. 8. Left hand star right back to place. 29-32 Same 4 turn individually CW in place to join L hands in the center and walk forward and CCW for 8 steps. Repeat as long as the music and caller last. When active couples progress to the bottom of the set, they change places and become inactives. When inactives progress to the top, they cross over and become actives. Folk Dance Problem Solver (1987), Society of Folk Dance Historians (SFDH), San Antonio, TX. Canadian Breakdown. An American Contra devised by Lawrence (Duke) Miller prior to 1950, and based on an English dance described to him by a glove cutter. Formation: Longways set: 1-3-5-etc. cross over. 1-4 Do-si-do with the one below, allemande right with your partner. 5-8 Allemande left with the one below, swing partner in center. 9-12 Down the center and back, cast off. 13-16 Left-hand star, back to place.